If a movie’s pre-release potential could be counted in currency, Edge of Darkness would have been a mighty lucrative venture, yes siree! 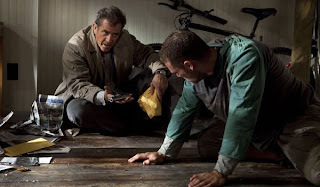 Not only does the project mark the long-awaited return of Mel Gibson – in classic Mad Mel mode, no less - to the acting world, it also boasts a screenplay co-written by The Departed Oscar-winner William Monahan and the capable directorial duties of Martin Campbell, the British helmer responsible for revitalizing James Bond twice with 1995’s GoldenEye and 2006’s Casino Royale. Heck, even the film’s original source material, the highly lauded 1985 BBC mini-series of the same name, is of the utmost calibre. One would not have been foolish to assume that, given the prestige and obvious strengths of the ridiculously tal ented individuals involved, the final product would be a solid A-grade mainstream thriller. Sadly, however, they would be very, very wrong, as Edge of Darkness is anything but. Rather, it’s an utterly boring, ungainly mess; an ugly mishmash of loosely connected plot threads that’s tries to be both an intimate revenge tale and a socially relevant conspiracy yarn while failing miserably on both counts. 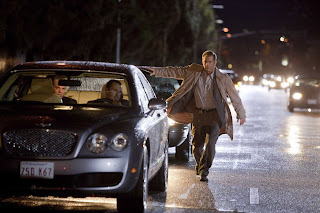 Regrettable, as Gibson is in fine seething form as Thomas Craven (If there’s a more awesome last name than “Craven”, I’ve yet to hear it), a hard-edged Boston homicide cop whose spritely daughter Emma (Bojana Novakovic) gets shot-gunned to smithereens in his front yard. Despite initially believing that the hit was intended for him, Craven inevitably winds up foll owing a trail of leads to her former place of work, the Northmoor Corporation, a radioactive waste facility with secret military connections, overseen by slick CEO Jack Bennett (Danny Huston – an actor skilled at playing characters who virtually ooze sleaze). Convinced of a connection between his daughter’s demise and the good folks of Northmoor, Craven sets out to expose the truth behind the obviously crooked company – a complicated task which becomes even thornier with the arrival of Jedburgh (Ray Winstone), a shadowy government-appointed “cleaner”, who may or may not hold the answers that the grieving father needs. Now, in the original six-hour plus televised version (also helmed by Campbell), these events no doubt – considering the voluminous praise surrounding it - played out like an intricately unfolding riddle, with each solved piece of Craven’s puzzle hitting the viewer like an astonishing revelation. 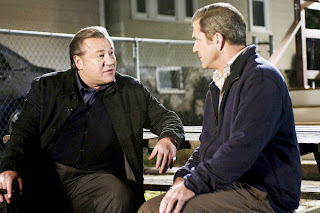 But here, streamlined into two hours, Edge of Darkness is confusing and clumsy, with almost every single new surprise delivered to Gibson and the audience via a one-note, exposition-spewing side character (who must, of course, begin each discourse by hysterically stating their refusal to cooperate). The only real exception to this rule is Winstone, whose Herculean efforts in imbuing his enigmatic operative with dramatic heft are akin to witnessing cinematic alchemy. Speaking in an gravelly, earth-rumbling timbre, and making fearsome use of his hulking build, he commands the screen like a true master, making even the direst descriptive dialogue flow as if it had originated from the mighty pen of Sir Billy Shakespeare himself. Nevertheless, the fine Brit thespian is done no favours by Monahan and Andrew Bovell’s script, which introduces both him and other key players with suitable pomp and circumstance, before abruptly scuttling them off-screen (onl y to have them later pop up when necessary) in order to regain focus on Craven’s plight. While Jedburgh’s crucial character arc is rushed and emotionally unsatisfying, other actors – such as Jay O. Sanders as Gibson’s cop partner – find themselves more or less stuck in Act 1; factoring heavily in the establishment of the plot before practically vanishing into thin air. Even the character of Emma – the impetus for the whole flippin’ story – does little more than furrow her brow, projectile vomit and take a one-way trip through a closed door. It’s impossible to share Craven’s considerable grief when the movie’s tragic victim is such a forgettable, charisma-deficient blank. Martin Campbell, a reliable journeyman director, proves unable to bring any life to the inert shambles around him, though he does try valiantly by shoe-ho rning in a completely pointless, but efficient, Bourne-esque fist-fight and aping Scorsese’s distinctive style of staging shocking bursts of sudden violence – a technique which often comes across as more comical than horrifying. With that said, the helmer has at least fashioned this snoozer into something pretty, with razor-blade editing and an omnipresent cloak of grim moodiness which, while overwhelmingly unpleasant to endure, is mostly consistent (minus the shamelessly unearned sentimental ending) and thematically appropriate. Frankly, when compared against 2008’s smart and engaging State of Play – another adored BBC mini-seri es adapted by Hollywood – it’s embarrassing how wildly this picture misfires. It’s a syrup-paced mystery film without an ounce of mystery, where the villains are shallow and unmistakeable and the hero is always ten steps behind even the slowest audience member. 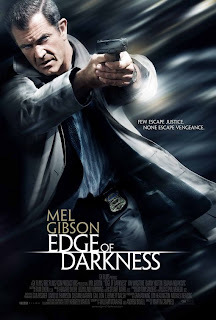 Ultimately, Edge of Darkness is a promising endeavour that disastrously crashed somewhere amidst its turbulent journey across the pond. *Originally printed in SFU's The Peak: Feb. 8th, 2010.